One of our ‘Source’ partners, Penny Bennett, has written about swale being used on Tipside in Todmorden. For more information on our partners at the ‘SOURCE’, please see this LINK. 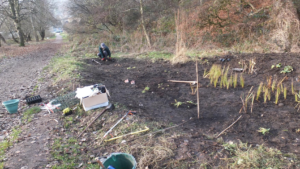 TRIG ( Tomorden Riverside Improvement Group) have been working on Tipside in Todmorden to protect and manage a biodiverse area of open space in the town centre for people and wildlife since 1998. Tipside is already a flood zone, lying immediately alongside the Calder, it has bunds at either end, installed by the Environment Agency as part of the first stage of the Todmorden flood alleviation works. This allows the river to escape its channel and flood over the open space in periods of extreme rainfall. Our latest project has been to construct a shallow swale, a saucer shaped scrape about a foot deep, on a particularly wet bit of the site. We wanted to do this to create a new wetland habitat, reinforcing what we already had, and to prevent water ponding on the existing footpath. 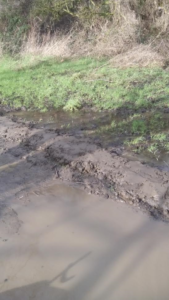 Access is often difficult for the many people that use the site after periods of heavy rain, and the path although tarmac has become very muddy since the Boxing Day floods. The swale will also function as a temporary water feature, helping to slow the flow by taking some surplus water during wet periods and then drying out during the drier summer months. Once the water reaches a certain level in the swale, it will make its way to the river via a new land drain under the footpath. We were successful in getting just under £1800 funding from the People’s Postcode Lottery earlier this year and carried out the works over a couple of days in the last week. 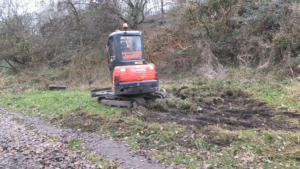 Local contractors Mitchell Excavation hollowed out a shallow scrape, ensuring our existing wetland plants weren’t damaged. We have some notable areas of Yellow loosestrife which is one of the only places in the Upper Valley where it is known to occur, and also Purple loosestrife ( no relation!) which is not common in Calderdale either. 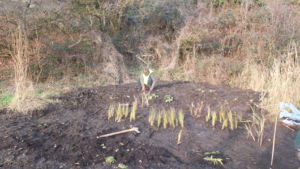 Once the hollow had been created we were able to plant our selection of wetland species. We have used plug and small pot plants from Naturescape, a firm that specialise in native perennial plants. Plugs are tiny seedlings with a bit of leaf and a lot of root and should grow rapidly in Spring. Seventeen different species have been used, which are all plants which could be expected to be native in this area, and which will tolerate a range of damp to boggy situations. Plants like soft rush and reed sweet grass provide the background planting with highlights from other plants such as marsh marigold, yellow flag iris and purple loosestrife. We wanted to create something which looks good for a long period, for example late flowering meadow sweet is included with May flowering cuckoo flower, and will be good for pollinators and other wildlife. 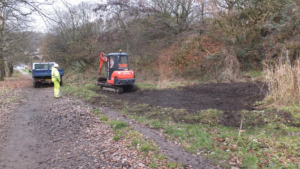 At the moment, the swale is quite dry, because we haven’t had that much rain recently, we are hoping that it will start to fill a bit over the winter, as this will deter dogs and bikes from exploring the area, and allow the tiny plug plants to establish. We will keep you up to date with how it starts to establish! How ‘mulching’ can help soil absorb rain water? What role can Natural Flood Management play as part of a solution to the flooding problems in the Calder Valley?